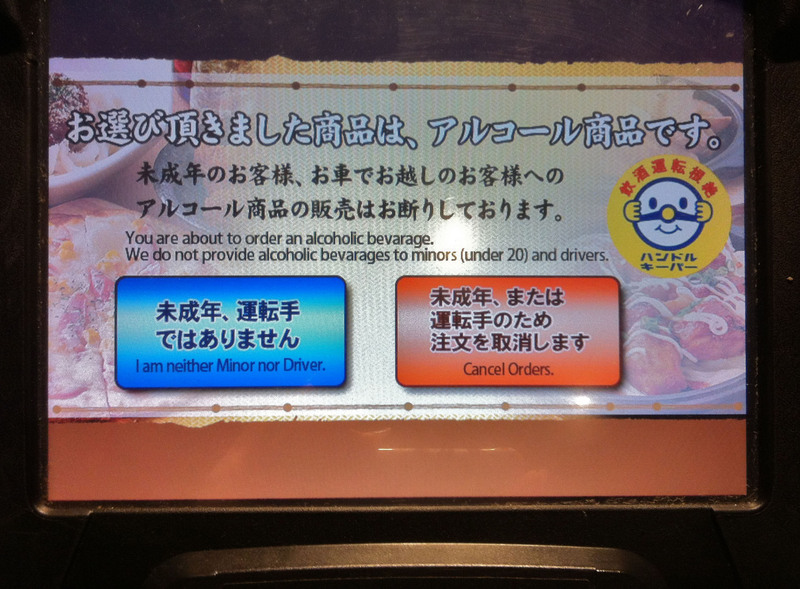 This is the order screen at the izakaya where my Japanese class had our end-of-term nomikai. The average Japanese teenager may have it rough when it comes to taking entrance exams that will determine his whole future, but he never has to spend hours in front of the mirror, practicing intoning the words, ” rum and coke” in a deep voice and desperately trying to look 21. All the underage drinker in Japan has to do is press the blue button, and the bar is open for business. Even if he couldn’t grow a beard in 6th grade. Here in Japan, drinking and driving is seldom a problem, because even if people have cars, they usually take trains (until midnight) and taxis (after) if they’re going to be drinking. Of course, this sometimes results in unfortunate platform pizza action (noodles are a popular drinking food, I’ve noticed) but the only person who gets hurt is the one with the hangover.